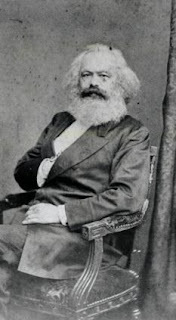 I have a new article on the website of the Future of Freedom Foundation on, "Karl Marx and the Presumption of a ‘Right Side’ to History, Part II." Last week I explained the assumptions and presumptions behind the frequent reference by those on the political “left” to being on the “right side of history,” and its origin in the nineteenth century dialectical materialist philosophy of Karl Marx. This week I demonstrate the logical fallacies and historical errors in the entire edifice of Marx’s conception of “history” having a mission and being on the “right side” of it. To begin with, every prediction that Marx made about the evolution and development of the capitalist system has been proven wrong over the last 150 years. Competitive, free market societies have not produced “conflict” between “labor” and “capital” but have made the factors of production complementary elements that work together to improve the material and general economic conditions of almost all. Furthermore, the very notion of a “materialistic” theory of history is absurdly backward, because it is not the “modes of production” that create social forms and the ideas of men, but rather it is human ideas that foster the creative innovation of methods of using potential modes of production to better the human condition. The belief that it is possible to predict the future course of human history, in the Marxian or related sense, demonstrates an arrogance and hubris that is ignorant of the very nature of the human condition, and a presumption of possessing knowledge that itself is only discovered as the human actors traverse from the momentary “present” to future “tomorrows” as they pursue desired goals and ends. The “left” lives in a fantasy land of their own making when talking about the “rights” and ‘wrongs” of the sides of history, that may give them a sense of moral superiority of knowing how and where to humanity should develop and take form, but is purely delusional and meaningless. “History” is made by human agents and the ideas they have. The task for advocates of liberty is to make that history by influencing the ideas and ideals that our fellow human beings come to hold and act upon.